Are you better off than you were forty years ago? This reference is more than just a slant at President Carter. It is a reference to then candidate Reagan’s campaign against Carter in 1980, when he famously asked Americans whether they were better off or not than they were when Carter began his term. What these arguments miss, however, are the fundamental changes these so-called “average” Americans have experienced over a much longer period. Ryan’s criticisms have “gone viral”, with numerous surrogates of the President being asked whether they feel that the country is better off. Maryland’s Democrat Governor Martin O’Mally, someone who reportedly has Presidential aspirations for himself, has now famously answered “no” to the question. His response caused considerable backlash, with everyone from Fox News to John Stewart responding to O’Mally’s comments. There is some empirical evidence to support Ryan’s claims. The argument draws on recently released polling data from Gallop, which asked voters in key swing states whether they were “better off than they were three years ago”. 56% of voters responded that they are not, while 40% responded that they are. This largely mirrors data of American voters more generally, with 55% responding that they are not better off. Importantly, these are not representative of real wages writ large. Rather, they are non-farm and non-supervisory wages from the private sector. This means that they are not biased upward by the very highest wages paid to private sector managers, COOs, and CEOs. Omitting these occupational positions is important because, as multiple studies have shown, wage inequality has increased greatly over the time period covered by the chart. 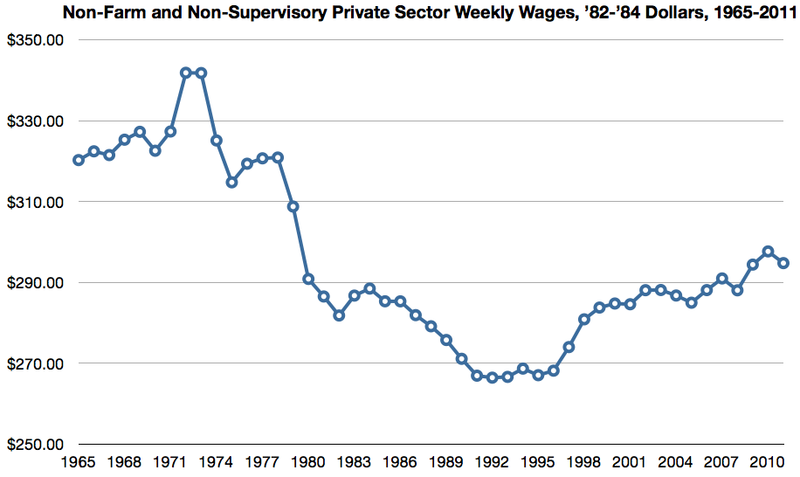 That is to say that supervisory wages have increased at a much greater pace than non-supervisory wages. These charts capture a good deal of what we might consider “middle class” Americans – they are not working in agriculture, not in supervisory positions, and work in the private sector. They are the same voters, then, that the Republicans are targeting with their rhetoric that average Americans are not better off than they were four years ago. When we look at wages, the grim reality is that many Americans are not better off than they were forty years ago. 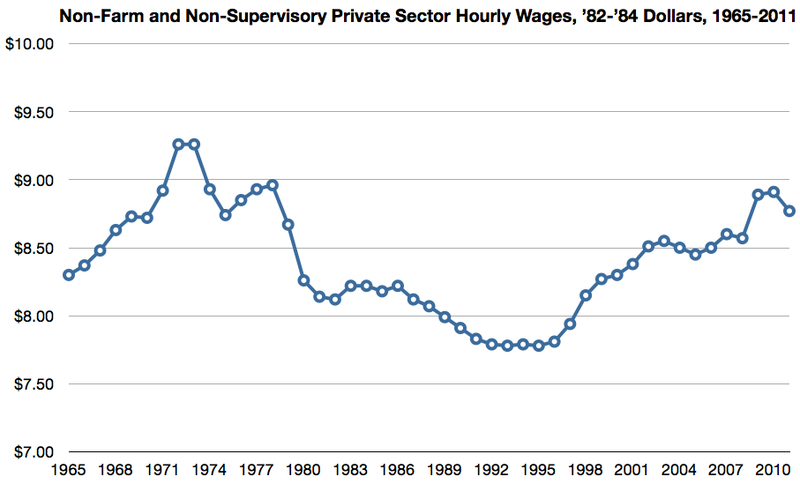 Average wages, both hourly and weekly, dropped substantially through the Nixon, Ford, Carter, Reagan, and George H.W. Bush Presidencies. It is not until President Clinton’s second term that the trend changes, with a general increase in average wages during that term through both George W. Bush’s two terms and Obama’s first term. Indeed, wages during the Obama-era are the highest they have been since Carter’s Presidency (the same Carter that Ryan described as overseeing the “good ‘ole days”). Nate Silver, a blogger and statistician at the New York Times, has an excellent piece about whether or not this rhetoric really matters. He maintains that “it is best not to take the question literally” and warns that had voters done so, it may have been to the detriment of Reagan’s campaign. Rather, what is key for Silver is whether voters are better off on average than they were a year ago. In the case of Reagan this shift in the argument may have been the difference for him on Election Day. What Silver is tapping into is the logic of voters at the polls. This is an important topic, because this may be ultimately what influences the decision making process for those who are not ideologically wedded to either Governor Romney or President Obama. But it misses an important story that is not about the standing of the country over the last year or the last four years. The fundamental issue here is that Americans, in terms of hourly and weekly earnings, are indeed better off than they were four years ago, but remain worse off than they were forty years ago. What the Republican Party’s rhetoric masks is this trend downward for “average” Americans (a term I use very loosely) that has existed since the 1970s. If Americans are indeed worse off, blaming President Obama does not tell the story that these data do.